Our 2018 - 2019 schedule of classes will be posted here on August 1st. We are excited to offer the many styles of dance including Ballet, Tap, Jazz, Acrobatics, Hip Hop, Lyrical, Modern, Leaps & Turns, and Technique classes. 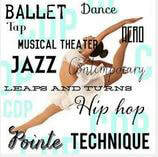 We also will be offering many combination classes for the younger dancers. We have classes for all ages and levels including our Mommy or Daddy & ME class for those as young as 18 months old. Please come back and check out our class schedule soon! Enrollment will be available too. We are all born to dance. It is good for the soul!